NASA's Voyager 1 spacecraft — the farthest-flung object created by human hands — has traveled beyond the sun's sphere of influence and may even have left the solar system forever, a new study suggests. On Aug. 25, 2012, 35 years after the Voyager 1 mission launched, Earth's most distant spacecraft detected a sharp change in the intensity of fast-moving charged particles called cosmic rays, suggesting it had left the outermost reaches of the heliosphere marking the edge of the solar system. "Within just a few days, the heliospheric intensity of trapped radiation decreased, and the cosmic ray intensity went up as you would expect if it exited the heliosphere," said Bill Webber, professor emeritus of astronomy at New Mexico State University in Las Cruces, in a statement. The scientists still don't know for sure, however, whether the probe has entered interstellar space or if it remains in a mysterious in-between region Voyager team members first discovered a few months ago. "It's outside the normal heliosphere, I would say that," Webber said. "We're in a new region. And everything we're measuring is different and exciting." Voyager chief scientist Ed Stone said most mission researchers don't believe the spacecraft has popped free into interstellar space just yet. "It is the consensus of the Voyager science team that Voyager 1 has not yet left the solar system or reached interstellar space," Stone, a physicist at Caltech in Pasadena, said in a statement. "In December 2012, the Voyager science team reported that Voyager 1 is within a new region called ‘the magnetic highway’ where energetic particles changed dramatically. A change in the direction of the magnetic field is the last critical indicator of reaching interstellar space, and that change of direction has not yet been observed." 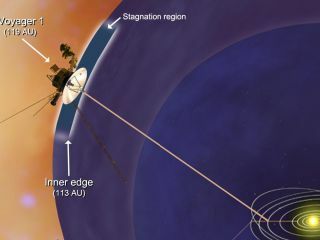 Webber and his colleagues noticed the dramatic cosmic ray signal drop when Voyager 1 was about 11 billion miles (17.7 billion kilometers) from the sun. Anomalous cosmic rays trapped in the heliosphere's outer reaches dropped to 1 percent of their previous level. Meanwhile, galactic cosmic rays, which come from outside the solar system, jumped to twice their previous levels, reaching their highest levels since the spacecraft launched, researchers said. The findings have been accepted for publication in the journal Geophysical Research Letters. Voyager 1 was actually the second of NASA's two Voyager spacecraft to launch on historic tours of the solar system. Voyager 2 blasted off on Aug. 20, 1977, with Voyager 1 following a few weeks later on Sept. 5 of that year. Both spacecraft carry a gold-plated copper disc containing sounds and images of Earth. The golden record is about 12 inches (30 centimeters) across and attached to the hull of each Voyager probe. The records are engraved with a diagram that explains how to play them and where Earth can be found, just in case the Voyager probes are discovered by intelligent extraterrestrial lifeforms. Editor's Note: This story was updated at 2:40 p.m. EDT to better reflect scientists' uncertainty about whether or not Voyager 1 has left the solar system, and to add thoughts from Voyager mission chief scientist Ed Stone. Follow Tia Ghose on Twitter @tiaghose. Follow us @Spacedotcom, Facebook or Google+. Original article on SPACE.com.